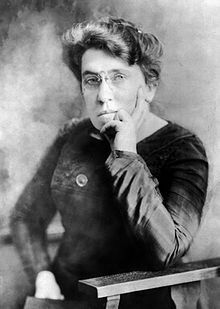 In a time when segregation was entrenched, when women couldn’t vote, when workers had few rights, when speech was far from free, Emma Goldman stuck to her beliefs, even when they landed her in prison, even when they got her deported. She was a true revolutionary in every sense of the word. Goldman famously said, “It requires less mental effort to condemn than to think.” Nowhere is this more accurate than on the issue of marriage equality. With today’s progress for gay rights, I’d like to point out, and thank her for, her support of gay rights. This entry was posted in History and tagged gay, gay marriage, gay rights, goldman, history, human rights, LGBT, lgbtq, marriage, marriage equality, politics, rights, scotus, united states by Mac McCann. Bookmark the permalink.